Many films have been labelled with the “classic” tag over the years. Few really deserve it, however Casablanca certainly does. I recently had the opportunity to catch the film on the big screen for the second time, and it still works – seventy years after it was first released. The script by Julius and Philip Epstein, Howard Koch and an uncredited Casey Robinson sparkles with wit and sophistication. Much of Casablanca has permeated modern culture, from the use of the song ‘As Time Goes By” to the oft quoted “here’s looking at you, kid”. Humphrey Bogart brings movie star charisma to the role of Rick, throwing out one-liners with skill and precision, while Ingrid Bergman is a suitable romantic foil. As great as they are, they are no match for Claude Rains’ Captain Renault. Rains revels in the role, clearly enjoying every moment. 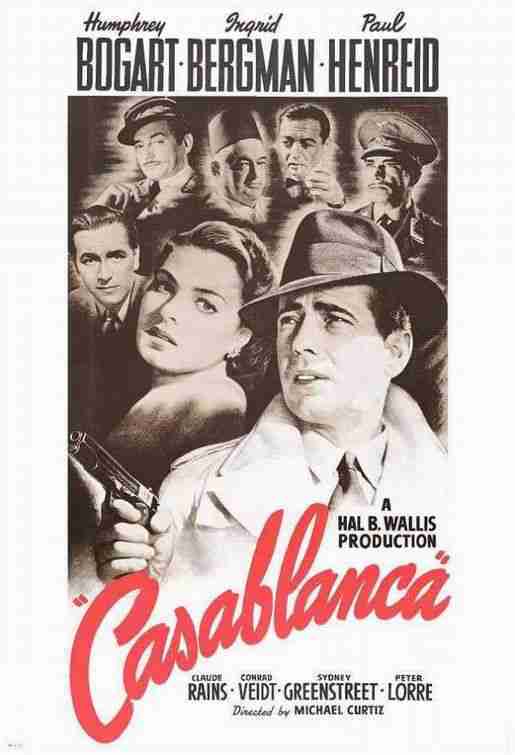 Casablanca shows that they really don’t make them like they used to.